The Kammeroque Ensemble, founded by Donna Roselius, performed for the monthly Open House at the Roaring Sea Gallery in Port Orford, OR, for about twelve years. Consisting of a core of about eight players, the group would present a variety of music at each performance that would range from a solo or duet to a large ensemble of over a dozen musicians. Although the bulk of the selections were from the Baroque style of European music, other varieties would get hearings as well, from Oriental to modern to Native American and more. Every once in a while the group also played elsewhere. Yvonne and Norman played with the group for a little over a year until it took an extended hiatus due to health problems in the Roselius household. 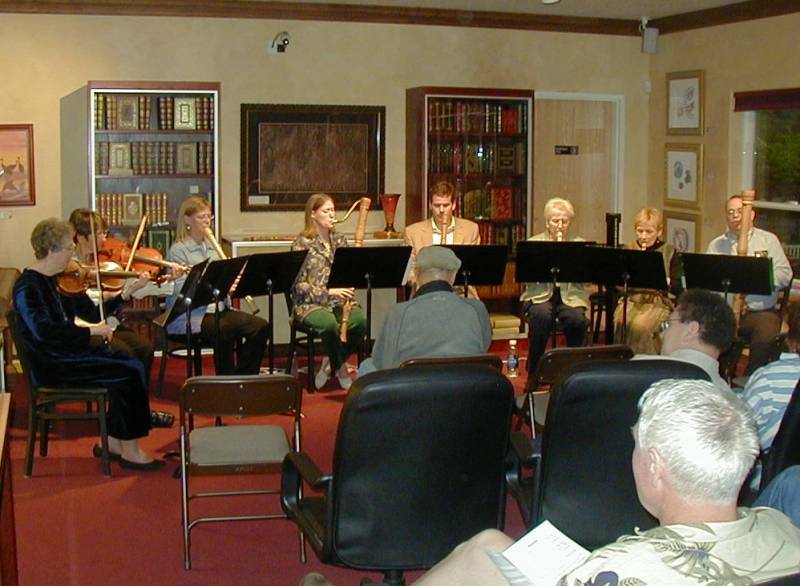 The Kammeroque players presented a concert at Gold Beach Books on June 11, 2005. The performance included works for as few as three instruments and as many as eight. This photo, taken during an eight-part piece, shows Yvonne playing a bass recorder and Norman with the great bass recorder.